The IP Phone 7811 delivers simple, highly secure, and cost-effective VoIP communications for small to large businesses. It is ideal for occasional-to-light communications needs, such as in lobbies, cafeterias, and conference centres. 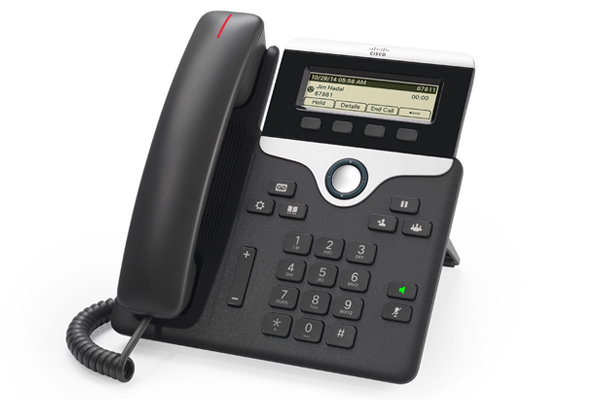 Cisco IP Phone 7811 is a single-line endpoint designed for common areas and knowledge workers with occasional to light voice communications needs. It comes with a 3.28-inch (83-mm), high-resolution monochrome display and a speakerphone. It also has an IEEE 10/100 integrated switch to support a local PC. It’s easy to manage, cost-effective and provides comprehensive unified communications features that can increase the productivity of your workforce. Ease of use with backlit displays to enhance viewing and navigation, headset and speakerphone support on most models for added flexibility, and ergonomically rounded keys for a superior tactile experience. ● Non-backlit, greyscale, 3.28” 384×106 pixel-based display on the IP Phone 7811. ● The default handset is a standard narrowband-capable audio handset (connects through an RJ-9 port) for the IP Phone 7811, and wideband on the handset is available with the purchase of an additional wideband handset. ● The narrowband handset (for the IP Phone 7811) produces a magnetic field that attracts small metallic objects such as pins and staples. To avoid possible injuries do not keep small metallic objects close to the handset. ● The phone supports backlit indicators for the audio path keys (handset, headset and speakerphone), select key, line keys, and message waiting. ● Headset key is not available on the IP Phone 7811. ● The IP Phone 7811 is available with a black bezel. ● Only 1 foot-stand position (45 degrees) is supported on the IP Phone 7811. ● The phone can be installed on a wall using the optional wall-mount kit (available separately). Switch to cloud-based telephony now!